At Edvotek, we field tech questions every day. 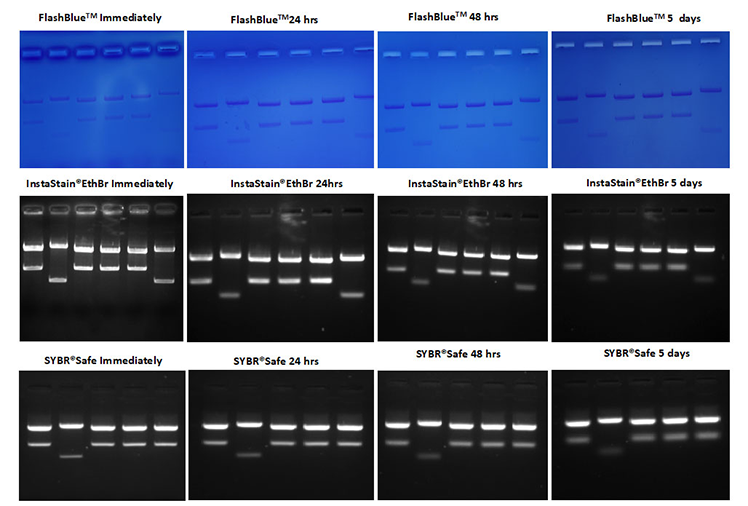 Our dedicated scientists have heard it all and one of our most common topics of inquiry is staining agarose gels post electrophoresis and more specifically, how long the gel will keep following staining. Now with schools up and running across the country for the 2018-2019 year, we wanted to pass along our staining tips with the Labor Day break right around the corner. 1. Following electrophoresis and staining, place each gel in a small ziplock storage bag. 2. Add an additional 1-2 ml of electrophoresis buffer. 3. Place in the fridge. The key to this procedure is to only put a tiny amount of buffer into the bag – 1-2 ml allows the gel to stay hydrated but does not allow the DNA to diffuse out. We’ve had great success using this method with FlashBlue™, InstaStain® Ethidium Bromide, and SYBR®Safe stains. A final option is to use a highly diluted FlashBlue stain (1:150) to soak the gel for 3 or more hours. This method is outlined in many of our protocols, but may require an additional destaining step of 2-3 hours when stained for more than 12 hours.